Get a blueprint for growing your business with our free Google report. We have special tools that will analyze your website compared to your top 5 competitors. This will show the winners and losers on Google. This valuable information will enable you to win in your local market. You can’t win the race if you can’t see the course! The top 4 positions on Google account for 83% of the clicks. Higher rankings result in more leads and ultimately more clients. Knowing how your company compares to your competitors is the first step in designing a winning marketing strategy. Many companies are flying blind with their marketing programs, not knowing how it’s truly working. We will help you bring in more clients with data driven marketing decisions. 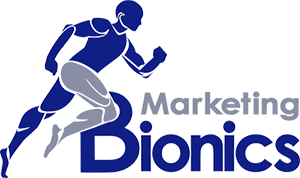 Make your business better, stronger and faster with Marketing Bionics. 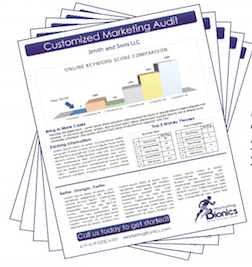 Request Your Free Report Today! All reports are created manually by a professional analyst and delivered via email within 3 business days.